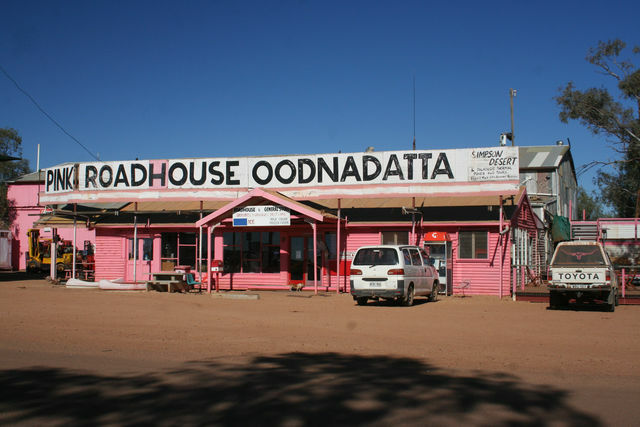 Today we head off to the tiny whistle-stop of Oodnadatta on the Oodnadatta Track. We have about 50 kilometres to do to get to Marree and then we will turn onto the Oodnadatta track. We are just in the process of breaking camp when one of the grey nomads who has a caravan here came over looking for a set of jumper leads to start his car. Plane Henge: Mutonia Sculpture Park, created by sculptor Robin Cooke. Plane Henge consists of two Beechcraft Barron aircraft, brought by road from Victoria’s Moorabbin Airport and erected with the help of around 50 people. I gave him a hand and we had a chat over the bonnets of the cars while we were getting his motor back on the road. That is the hazards of running a car fridge off a car that does not run dual batteries. We stopped at Marree for petrol and picked up a few basic items at the general store before heading further west. This time the track follows closely the old now defunct Ghan railroad and travels around the bottom of Lake Eyre South. This provides a lot of interest points on the way to stop and have a look at. 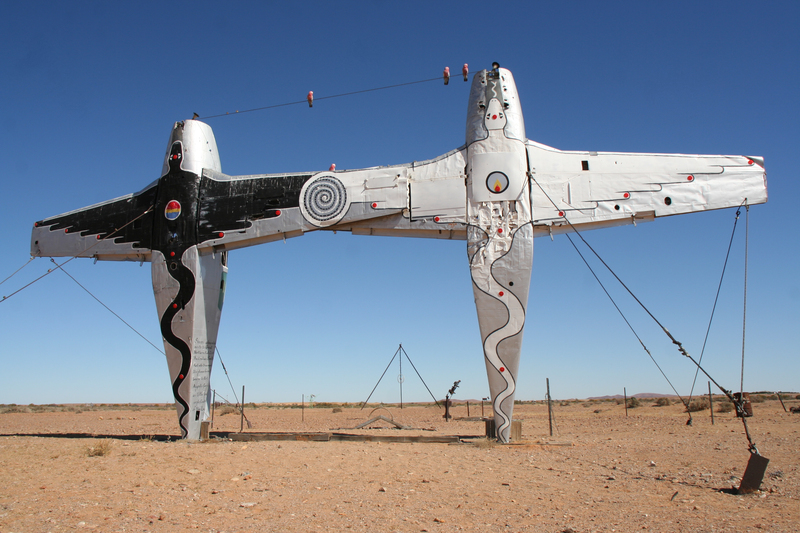 One of these places was Plane Henge, the Mutonia Sculpture Park, (by Robin Cooke), a group of sculptures in the desert made of parts from all sorts of machinery, bits of railway and of course airplanes. Coming from Marree the first sign of these creations is two 1940’s Beechcraft Barron aircraft standing on their tails and joined at the wings like some modern-day totem in the desert. We spent ages wandering around this display that must have stretched over 5 acres beside the road. The road from here was very badly corrugated and we had to take it a lot slower than we had on the Birdsville track, which we could pretty much keep up highway speeds on. This section of the track runs around the bottom of Lake Eyre South and there are some close vantage points to give you an impressive view of these vast salt plains. While we were there, it appeared as if, far in the distance the lake had some water in it. 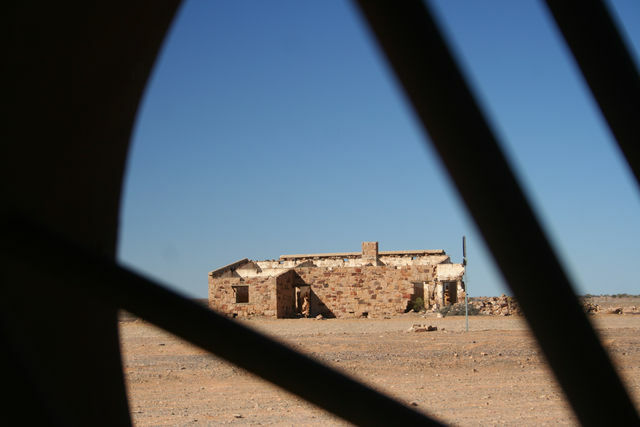 We continued west from Marree making several stops at old sidings and workers huts from the old Ghan Railway. The mud brick huts have very thick walls, allowing them to blend into the countryside. I imagine the design helped in keeping the summer heat out and keeping the warmth of the fire in during winter. Our lunch break was at Beresford Bore, which was another rail siding situated on the Anna Creek cattle station. We found the spot because we saw other traffic come out of it so we thought we’d go and see for ourselves what was down there. There is a fairly intact building here, as well as a significant water hole and water towers etc that were part of the old rail road. The way in is via a narrow track on the dam above the water hole. Steep sided and only a single vehicle wide it provided an interesting drive into the ruins, and near the end the track plunges down a short steep drop from the edge to the old railway crossing. Coming back was even more interesting, to avoid the climb up that steep drop off, I skirted around what looked like an easier path. I gunned the vehicle up the side of the hill only to find there was a hard left turn at the top if you wanted to avoid going straight over and into the water hole. I saw all of this just a bit too late and ended up with the back wheels still on the track but both front wheels down the bank. A definite “Bugger” was required here. I then tried to put the vehicle into four wheel drive, but it wasn’t having any of it. It got to a point where I could not select either two or four wheel drive. This was a double “Bugger”. Al and I both got out to have a look at the situation, if I could get the vehicle back into some sort of gear, preferably four wheel drive then I could back her around and face the right way on the track. I found that by turning the motor off completely and moving it into four wheel drive it seemed to work okay, it just wasn’t playing the game with the car running. So I switched it off and moved it into low range and then started again. This time the truck behaved itself and I managed to move it back to solid ground and continue our way out of the lunch spot. An example of how a couple of seconds inattention can lead to a disaster. This was the only time in the whole trip we needed to use 4WD. We got back on the road and continued towards Oodnadatta with a brief stop at Williams Creek to once again fill up with petrol. 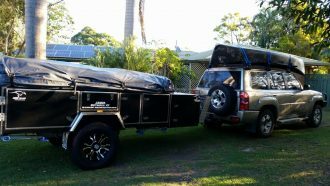 We arrived in Oodnadatta somewhere around four O’clock South Australian time and after a day or so of extra activity I decided that we would not put the tent up tonight, we would try to book into the pub in town. We passed the famous “Pink Roadhouse” on our way to the pub and decided we would wander back that way when we after checking in. The pub was old and tidy, a couple of guys were in the bar having a drink. The publican was a grey haired old gentleman who spoke quietly and ran his words together making him a little hard to understand. 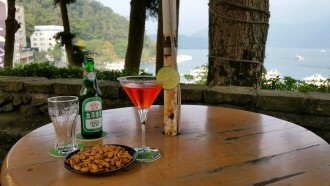 He set us up with a room and after unpacking the basics we returned to the bar to have a quick beer before exploring the town. Exploring the town took all of about five minutes, there wasn’t much of it and the “Pink Roadhouse” had been a little over hyped in the journals and magazines I think. We went to use the Internet but it was broken, so we went back to the pub and continued drinking. I chatted with a guy who was a State-wide teacher and his job was to relieve at any school that required help. He had to get in his car and drive to anywhere needing him at the drop of a hat. He told me he had once driven twenty-four hours to get to a job. He was very interesting to talk to. An old aboriginal guy came up to us and started a conversation, he was also extremely hard to understand but best I could figure he had been here when the Ghan was in operation and he remembered Pounds, Shillings and Pence and he had something to do with camels. Never mind, he was lovely chap and after a while he wandered off. Three young Italian gentleman turned up after a while and also booked in for the night.